Learn how to make great apple cheesecake recipes! 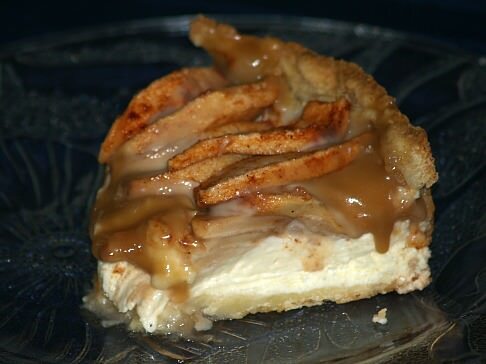 Most people do not think of cheesecakes when they want an apple dessert recipe; likewise they do not think of apples when desiring a creamy cheesecake. Why not? Perhaps it is because both apples and cheesecake recipes each have such a huge catalog of various well known recipes that one does not take time to blend the apples and cheesecake together. I learned how to make apple cheesecake recipes because this combination made great common sense. 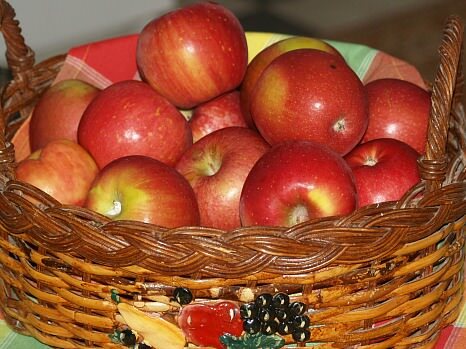 First, we all know from the beginning of the American colonies, the apple has been the most important fruit here. It helped to sustain the diets of the early settlers as well as medically helping them though various ailments. When dried and preserved having the apples to eat made living through the hard winters more bearable. I also learned how to make apple cheesecake recipes because they have a perfect match of ingredients. Since the origination of the Philadelphia Cream Cheese over one hundred years ago the continued production of wonderful recipes have also been developed. The combination of the American apple with the American cream cheese has to produce a delicious dessert. The recipes below will show just that! Lightly grease a 9 inch spring form pan. Combine the crumbs, 3 tablespoons sugar, cinnamon and butter; press onto the bottom of 9 inch spring form pan and bake 10 minutes. Combine the cream cheese and ½ cup sugar in a mixing bowl and beat on medium speed until blended; Add eggs one at a time mixing well after each. Blend in vanilla and pour into baked crust. Toss apple slice with the 1/3 cup sugar and cinnamon; arrange apple slices on the top of the cheese mixture and sprinkle the chopped nuts over the top. Bake for 1 hour and 10 minutes. Loosen cake from the rim of the pan. Let cake cool before removing the rim. Chill before serving. 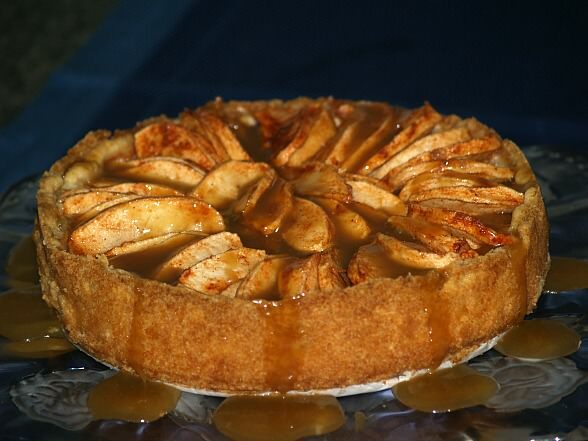 Apple cheesecake recipes can be varied by changing the crust recipe which you use. Try a chocolate crust or switch the crust recipes on these cheesecakes. Preheat oven to 375F degrees; lightly butter a 9 inch spring form pan. Sift both flours into a small bowl; stir in the ¼ cup sugar. Cut butter into the flours with a pastry cutter until small crumbs. Add egg yolks and mix until ball forms. Press dough into the bottom of prepared pan and 2 inches up the sides. Prick bottom and sides lightly with a fork; refrigerate until ready to fill. Beat the ½ cup sugar and cream cheese together until fluffy. Add 2 eggs beating after each addition; add vanilla and continue beating until smooth. Spread over the cold crust. Mix the 1/2 cup sugar, cinnamon and nutmeg together; sprinkle over the sliced apples tossing to coat. Arrange the apples on the top of the cheese mixture. Bake about 50 minutes or until the apples are tender and filling is set. Cool completely and refrigerate overnight. Serve with the following warm caramel sauce recipe. Melt the butter in a medium saucepan; stir in the brown sugar and corn syrup. Bring mixture to a boil stirring constantly; boil until sugar dissolves about 1 minute. Slowly stir the whipping cream into the hot sugar mixture and bring just to a boil. Quickly remove from heat and cool to warm; spoon over cheesecake. In many apple recipes like the apple cheesecake recipes, applesauce is used in place of the apples. The sauce gives a wonderful apple taste all through the dessert. Combine cream cheese, flour and sugar; beat until well blended. Add applesauce, cinnamon and nutmeg; blend well. All apple cheesecake recipes do not have to be made with cream cheese; try this one made with cottage cheese. Combine 1 cup flour and ½ teaspoon salt; cut in shortening until crumbly. Add water and blend in until dough is moist enough to hold together. Shape into ball and roll out on floured surface to fit a 9 inch pie pan. Fit dough into pie pan; flute edges and set aside. Combine ¾ cup sugar, 2 tablespoons flour and ¼ teaspoon salt; blend. Add cottage cheese, eggs, lemon juice and vanilla; mix thoroughly. Stir in apples; turn into pastry lined crust. Combine 1/3 cup flour, ¼ cup sugar and cinnamon. Cut butter in until crumbly and sprinkle over apple filling; bake for 40 to 50 minutes.